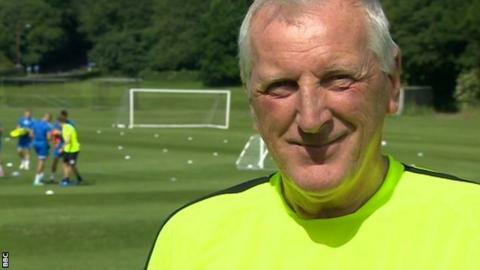 Ronnie Moore wants to reach the career milestone of 1,000 games as a manager and to achieve that feat while in charge of his current club Hartlepool. Moore, 62, reached the 28th anniversary of his first managerial appointment at Tranmere in February this year. He has since managed 857 matches during his career, during which he has also managed Rotherham and Oldham. "I've been in football all my life, it would be nice to stay here and get to 1,000 games," Moore told BBC Tees. Liverpudlian Moore, who helped Hartlepool to safety with a remarkable turnaround in form at the end of last season, is waiting to sign a new deal at Victoria Park. Moore would be following in distinguished footsteps if he reaches his 1,000-game landmark. Men to have already passed the milestone include Sir Alex Ferguson, Sir Matt Busby, Sir Bobby Robson, Arsene Wenger, Roy Hodgson and Brian Clough - whose managerial career started at Hartlepool. The negotiations have been taken on by new owners JPNG and chairman Gary Coxall. "Why would we want to go? At this time, we can do no wrong but we know in football how quickly that changes," Moore said. "We're just waiting. We spoke to the chairman - myself and assistant Sam [Collins]. We're waiting to get the contracts sorted out. "Once we get that sorted, we send them off and let the League Managers' Association have a look at it and we take it from there."